Keep windows closed and use air conditioning if you are allergic to pollen or outdoor molds; don't use fans, as they can stir up dust. Filter the air. Cover air conditioning vents with cheesecloth to filter pollen and use a high efficiency particulate air filter (HEPA) if you have a forced air furnace. Clean air filters frequently and air ducts at least once a year. Keep the humidity in your house below 50 percent to prevent mold growth. Avoid areas where molds may collect, including basements, garages, crawl spaces, barns, compost heaps; clean these areas often. Install dehumidifiers in basements and other areas of the house where mold may collect; clean these devices every week. Air out damp clothes and shoes (in the house) before storing. If you have pets, consider keeping them outside, or perhaps ask someone else to take care of them; animal dander and saliva are common allergens for many people. Otherwise, do not allow pets in the bedroom and consider bathing your pets often. Do not allow pets to sit on the furniture. Close air ducts in the bedrooms. Don't collect too many indoor plants, as the soil encourages mold growth. Use plastic covers for pillows, mattresses, and box springs. Avoid overstuffed furniture and down-filled bedding or pillows. Remove stuffed animals from the bed. Wash your bedding every week in hot water, hotter than 130 degrees F.
Wear a mask and gloves when cleaning, vacuuming, or painting to limit dust and chemical exposure. Avoid Venetian blinds or long drapes, as they collect dust. Replace old drapes and use window shades instead. Make sure there is an exhaust fan over the stove to remove cooking fumes. Minimize walks in wooded areas or gardens. Try to avoid extreme temperature changes, as they are triggers for some people with asthma. 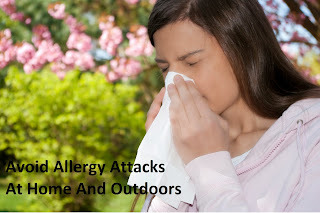 If possible, stay indoors between 5:00 a.m. and 10:00 a.m. when outdoor pollen counts are usually the highest. Wear a mask (such as an inexpensive painter's mask) when mowing the lawn if you are allergic to grass pollen or mold; if possible, avoid mowing and being around freshly cut grass. Wear a mask when gardening, as flowers and some weeds release pollen and can cause allergy symptoms. After being outdoors, take a shower, wash your hair, and change your clothes to remove pollen that may have collected in your clothes and hair. Wear shoes and long pants and sleeves, and do not wear scented deodorants, perfumes, shampoos, or hair products in order to protect yourself from insect stings. Dry clothes in a dryer. Don't hang clothes or linens out to dry, as pollen and molds may collect in them and can make your allergies worse. 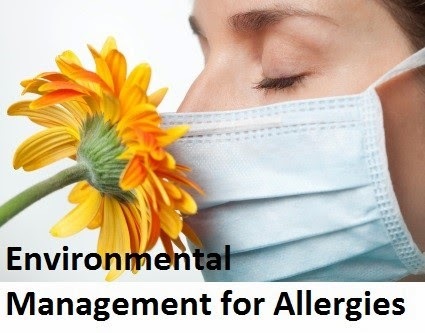 Discuss your child's allergies with school personnel. Inform school personnel about the medications your child is taking and make arrangements to leave necessary medications at school. Encourage sports participation, but inform coaches of medications that your child may need to take in association with activity. For food allergies: avoid the foods that cause your allergy symptoms by carefully reading ingredient labels and asking about the food preparation methods when dining out. Choose fresh foods rather than prepared or processed foods. If you have severe symptoms, such as anaphylaxis, carry an epinephrine injection kit (EpiPen or Twinject) with you at all times. Pack your medications with you in your carry-on bag. Bring an extra supply of medications in case you need them.